One way is to conduct economic impact studies, which are often used to secure additional funding or support for many different types of organizations and businesses. For markets, these studies can measure economic impacts on local communities in quantifiable terms and make the case for greater support. The potential economic impacts of public markets and farmers markets include direct benefits (e.g. profits to business owners in the market, job creation, sales and real estate tax revenues, etc.) and indirect benefits (e.g. stimulating development downtown, enhancing the park and waterfront as a place, farmland preservation, etc.). This section is specifically intended to provide a resource to markets wishing to measure their economic impact on the local economy. We provide two tools--one developed for PPS by Econsult, an economic research firm in Philadelphia, based on expenditures made by vendors (i.e., to produce the product sold) and management, and a second tool developed by Marketumbrella.org in New Orleans which relies on customer purchasing information. These tools provide only estimates, however, and are subject to testing in the field--so let us know your results and suggestions for improving them: email us at info@pps.org. We hope they will provide some useful data that market organizers and sponsors can use to build greater partnerships with their local communities--and your help will allow us to sharpen them. Comprehensive economic impact analysis is expensive and beyond the means of most public markets. Two tools are now available to help you complete a more cost-effective impact analysis, although the results are only estimates and will not give you the complete results a comprehensive analysis would provide. Estimating the Economic Impact of Public Markets: Prepared for PPS by Econsult Corporation, this tool estimates the overall economic impact of a market. It is important to read the report carefully so that you understand how to use the data provided to estimate the impact of your market, but the process is relatively straightforward and does not involve extensive data collection.Recognizing the diversity of public markets and the communities they serve, PPS asked Econsult Corporation to create a stylized typology of public markets that can be used as a basis for estimating the potential indirect and induced expenditures of specific types of public markets. In conjunction with PPS, Econsult analyzed data on the expenditures of seven public markets and their vendors in communities across the country. (Some of this information was very difficult to collect from vendors, so there are some gaps.) These markets differed in terms of their scale, various mixes of vendors, and the local economies (i.e., large city, small city, or small town) in which they are situated. Thanks to the Ford Foundation for funding this effort. The Sticky Economics Evaluation Device (SEED): This is a web-based approach that also provides a straightforward mechanism for collecting data about farmers markets from customer surveys and counts, and then using these data to estimate direct and indirect economic impacts using a standard "multiplier" -- that is, the potential indirect and induced expenditures of specific public markets. The website also provides useful information about economic impact studies. In a 2002 survey of over 800 customers from a variety of indoor and open-air markets around the country, PPS discovered that 60% of market shoppers also visited nearby stores on the same day; of those, 60% said that they visited those additional stores only on days that they visit the market. A 2006 study on farmers markets in the Canadian province of Ontario confirms these findings, showing that an overwhelming majority of farmers market customers also patronize at least one other nearby store on their way to or from the market, with many visiting two or more stores in the same trip. Pike Place Market, Seattle, WA: The market is estimated to have generated nearly $87 million in gross revenue in 2002, which translates to almost $4 million in taxes to the city, county and state. Jobs in the market that year ranged seasonally from 1,500 in winter to about 2,400 in peak season. Iowa: A 2005 study conducted by Iowa State University for the Iowa Farmers' Market Association reports that farmers markets in the state contributed up to $20 million in sales to the economy and created another $12 million in direct and indirect economic activity. Portland, OR: A 2008 farmers market study calculated a $17 million regional economic impact and estimates that farmers markets account for three percent of annual countywide consumer purchases of fruit and vegetables. 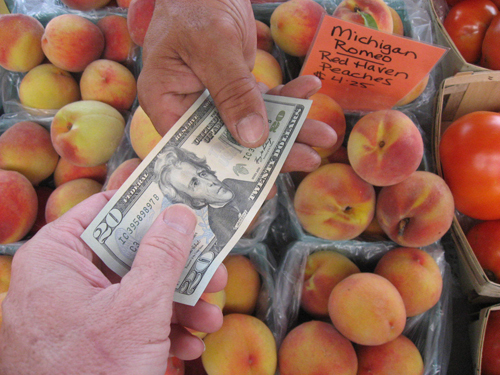 Flint, MI and London, ON: A 2013 economic impact comparative analysis of farmers markets in Michigan and Ontario. United Kingdom: Markets Matter: Reviewing the Evidence & Detecting the Market Effect is a 2015 study completed by the Institute of Place Management (IPM) and Manchester Metropolitan University (MMU) at the request of the National Association of British Market Authorities (NAPMA) as part of the High Street UK2020 project. This comprehensive review of published evidence demonstrates unequivocally, that markets contribute to the economic, social and political health of towns and cities. IPM and MMU conducted analyses of large footfall datasets to show that markets add to the vitality of specific centers and how markets act as important catalysts for change in town and city centers.